The Leicester Tiger thread running through Leinster continues. 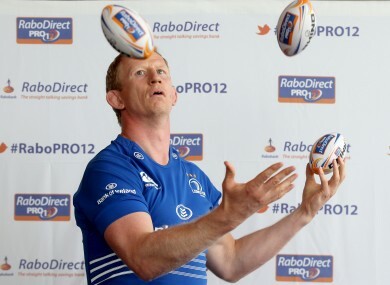 AFTER BIDING HIS time since taking over as Leinster coach, Matt O’Connor today confirmed that Leo Cullen would continue as the province’s captain by taking him to the RaboDirect Pro12 launch in Belfast. The second row will lead the side for the sixth year in succession. Prior to the official announcement, it was felt that his shared Leicester Tigers history with O’Connor made him a natural choice to remain at his post. However, the Australian coach’s silence on the matter up to today’s official duty in Belfast gave rise to speculation that the baton would pass on. “Leo will keep that role as club captain,” O’Connor responded to TheScore.ie today. Cullen meanwhile was typically humble, suggesting that any one of up to a dozen players within the squad could have taken up the job. “Absolute pleasure to do it,” Cullen said. “The role probably hasn’t changed a hole lot for me. We’re in a fortunate position where 10 or 12 guys could do the job easily enough. Email “'10 or 12 guys could be Leinster captain' but the honour goes back to Cullen”. Feedback on “'10 or 12 guys could be Leinster captain' but the honour goes back to Cullen”.